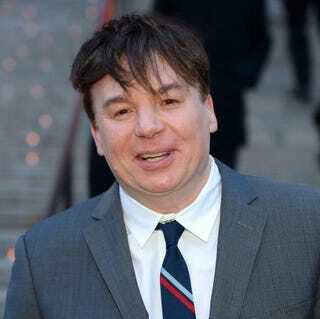 Mike Myers attends the Vanity Fair party in New York April 23, 2014, during the 2014 Tribeca Film Festival. Mike Myers will forever be the guy next to Kanye West when the enigmatic rapper decided to make an impromptu change during a 2005 Hurricane Katrina telethon. That is when West went off-script and called out President George W. Bush with the infamous "George Bush doesn't care about black people" comment. In the upcoming issue of GQ magazine, Myers recalled how it all went down. "I went there specifically because I wanted to help the Red Cross," Myers told the men's magazine. "I was supposed to be by myself, and I was like 'Fine,' then they said 'Do you mind doing it with somebody else?' And I always remembered that Live Aid thing of 'Leave your egos at the door,' so I said, 'Sure, of course.' And they said, 'Would you do it with Kanye West?' and I said, 'Uh sure.'" Myers, who told the magazine that he wasn't familiar with the rapper's work, then said that West gave him a heads up, but he had no idea what was in store. "… He said he was going to take some liberties with the thing … But I didn't know that the liberty would be calling out the president." Myers told GQ that he was glad to have been standing next to West when he delivered his message. "I'm, like, super proud to have been next to him," Myers told GQ. "The look on my face is … to be honest with you, I thought I handled it well." "For me it isn't about the look of embarrassment on my face, it is truly about the injustice that was happening in New Orleans," Myers said. "I don't mind answering the question but the emphasis of it being that I'm the guy next to the guy who spoke a truth."